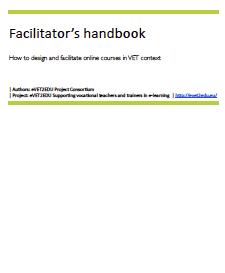 The Facilitator’s Handbook for e-learning course Design and facilitation of on-line courses in VET context was designed to provide support for trainers and educators in VET who are planning to implement the course into a training offer of own institution and moderate the course. The Handbook was developed on the basis of our experience gained during pilot phrase of the course. It may serve as a reference material for the facilitator who finds there various advice and tips on actions that may be undertaken to facilitate the course in efficient way. lists of possible problems that may occure in each module. The Facilitator’s Handbook is available under Creative Commons Attribution 3.0 Unported license. Due to a requirement of monitoring a level of interest in project’s results, in order to receive the copy of the handbook, fill in an online form. After receiving the copy, the habdbook can be re-used with regard to the terms of Creative Commons Attribution license.